An international audience of regenerative medicine interests has registered to attend a November 30 online expert panel discussion on the current nature and quality of therapeutic tissue stem cell preparations. Co-sponsored by U.S. stem cell biotechnology company Asymmetrex and U.K. headquartered regenerative medicine social media network RegMedNet, the panel will dispel common misconceptions about the nature of tissue stem cell therapy products and review emerging technologies developed to improve their quality. I hope the executives at the FDA Center for Biologics Evaluation and Research also attend. 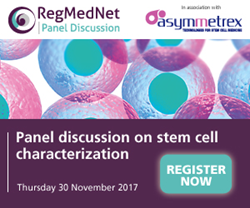 On November 30, Asymmetrex and RegMedNet will co-sponsor an online panel discussion on “Stem Cell Characterization.” Expert panelists include James L. Sherley, Director of Asymmetrex, Rouzbeh Taghizadeh, Chief Scientific Officer of AuxoCell, and Glyn Stacey, Executive Director of the International Stem Cell Banking Initiative. The panelists will discuss current challenges to producing and characterizing therapeutic stem cell preparations. They will consider stem cell populations commonly used for therapy, both after direct isolation and after manufacturing processes performed to increase the number of stem cells available. A major goal of the panel is to unveil and correct several widespread misconceptions and mis-approximations that exist in the field of regenerative medicine regarding the nature and quality of current stem cell preparations either used for treatments or evaluated for cell therapy development. Respectively, these erroneous ideas and the misguided practices that follow from them impede progress in the development of effective stem cell therapies. Donor stem cell preparations are often used as if they were homogenous stem cells. When, in fact, isolated treatment preparations are highly heterogeneous for tissue cell type, and stem cells are a minute fraction of the total cells in samples. A second misconception emerges from attempts to expand tissue stem cells in manufacturing processes. Instead of increasing the number of stem cells, these procedures lead to further decreases in the stem cell fraction; and sometimes to the point that no stem cells are present at all. Ironically, although such declines in stem cell activity are a widely recognized production problem, there are few producers who understand that it is the biological consequence of the unique tissue renewal properties of tissue stem cells. The mistaken thinking, which keeps these first two misconceptions going, is the confused belief that available “stem cell biomarkers” detect tissue stem cells specifically. In fact, these biomarkers detect both stem cells and committed progenitor cells, the latter which do not have the curative properties of stem cells. So, biomarkers that are widely used cannot count tissue stem cells. Given the first two misconceptions in stem cell characterization, it is understandable why this third misconception has greatly confounded progress in stem cell science and stem cell medicine. Without a means to count tissue stem cells specifically, it is impossible to monitor, and thereby optimize, their production or know their treatment dose. The panelists will also discuss potential solutions to the technical problems that underpin the misconceptions about the characterization of therapeutic tissue stem cells. Quantification, standardization, reproducibility, and automation will be discussed as core principles to improve both the quality of therapeutic tissue stem cells and their characterization. Emerging technologies like Asymmetrex’s AlphaSTEM Test™ for specific counting of adult tissue stem cells, which have potential to become needed solutions, will be reviewed as well. In his promotion of the event, Asymmetrex Director Sherley assures that, “For anyone interested in producing higher quality tissue stem cells, or obtaining higher quality tissue stem cells, this is the event to attend.” He adds, “I hope the executives at the FDA Center for Biologics Evaluation and Research also attend.” To increase Aymmetrex’s impact in accelerating progress in stem cell regenerative medicine, the company has set a goal of gaining inclusion of its first-ever technology for quantifying therapeutic stem cell dose in currently anticipated, or future, FDA policies for improving the quality of stem cell treatments in medical centers with approved therapies, FDA-authorized clinical trials, and private stem cell clinics.